Doutt Tool has proven expertise in precision grinding tungsten carbide gained from over thirty years of experience supplying to successful companies worldwide. We provide a complete service from one off prototype tools to high volume batch production. Doutt Tool specialize in precision grinding miniature carbide punches. 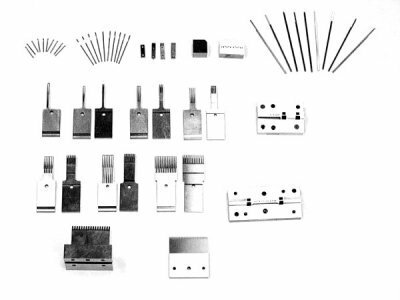 Many other tool shops choose to Wire EDM such punches, their reasoning is simple - wiring is easy and cheap and internal radii are eliminated by making tiny undercuts written into the cutting program. Here's the catch, the finish on wired carbide has surface micro fractures. This is no problem for a full sized punch but it's bad news for tiny, highly stressed areas of a small punch working at up to 800 strokes a minute. Breakages are unpredictable but not surprising. We consider this risk of fracture unacceptable so we always grind miniature punches. 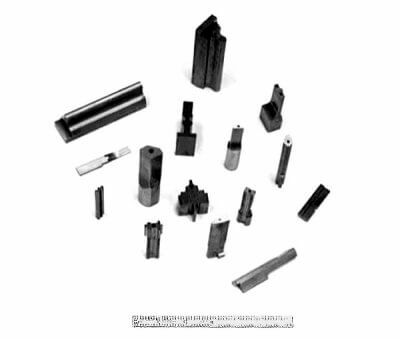 We are experts in surface grinding carbide punches and we know that grinding gives a surface finish entirely free from any micro fracture defects. 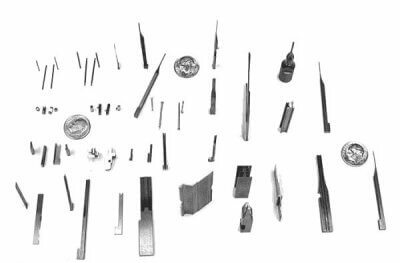 Our toolmakers select from a range of 500 pre-dressed diamond wheels which gives them the capability to grind virtually any profile carbide tooling - take a look at the Miniature Punch selection below. Doutt Tool designed and built their own custom fixture to dress diamond wheels with internal radii from .002" to .800" and outside radii up to 1.000". Our inventory of 500 diamond wheels are pre-dressed with radii from .002" to .034" in .001" steps and various other radii to .800". With this level of support our toolmakers can concentrate on what they do best - producing high quality carbide tooling fast - without the tedious process of dressing individual wheels. This efficiency is reflected in an extremely lean pricing structure that will reduce your costs. Furthermore, we believe we can make all your punches and dies, whatever size they may be, in high quality carbide at a lower cost than you currently pay out for hardened tool steel.